With that, We Practice confidently. As we embark on this journey, it is important as new teachers to learn the original form of this practice and to use that knowledge as a solid base to draw from. It will take time, energy and patience to learn and understand but ultimately you will be able to utilize this knowledge to erect a strong scaffold from which you can build your own yoga voice. The stronger the scaffolding, the stronger the voice, the stronger the voice, the better the teacher. The key for us here is to take advantage of how the brain likes to take in information. For instance, the brain loves beginnings & ends. Doesn’t care much for middles. Never has. Never will. Don’t believe it? Read this. I cnduo't bvleiee taht I culod aulaclty uesdtannrd waht I was rdnaieg. Unisg the icndeblire pweor of the hmuan mnid, aocdcrnig to rseecrah at Cmabrigde Uinervtisy, it dseno't mttaer in waht oderr the lterets in a wrod are, the olny irpoamtnt tihng is taht the frsit and lsat ltteer be in the rhgit pclae. The rset can be a taotl mses and you can sitll raed it whoutit a pboerlm. Tihs is bucseae the huamn mnid deos not raed ervey ltteer by istlef, but the wrod as a wlohe. Aaznmig, huh? Yaeh and I awlyas tghhuot slpeling was ipmorantt! ​Now do you believe it? And that’s just one small tidbit of the many ways we’ll be learning during our 8 weeks together. When you break it all down, in to its simplest terms, a 26x2 hot yoga class is a 90- minute oration. You are putting on a show and you are the lead. People have paid good money to see it. Think of it more like an opera than a rock concert because in our production we use a standardized script. It’s called the dialogue. You’ve heard it many times and might even be able to recite some of it right now, and that’s good. 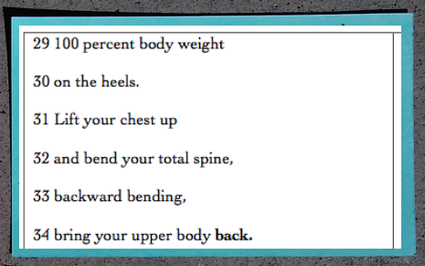 And every posture has its own script. The song has already been written, now you just have to learn to play it. The best way to prepare for this oration & memorize this script is with 3 x 5 Cards. We call it: Write it, See it, Say it, Hear it. This utilizes 3 senses for learning. 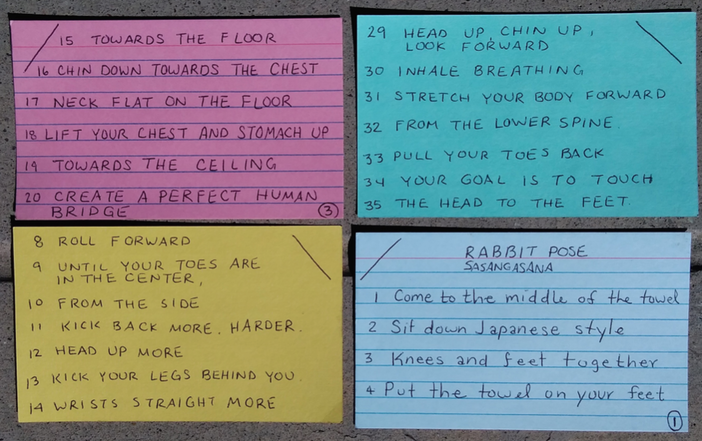 In order to make the most of this training, EACH POSTURE will require you to have your own set of 3x5 cards for that posture. In this training, we will be moving chronologically, from beginning to end, so create the earlier postures first. I recommend you start with the standing series, #s 1 – 12. WRITE IN BLOCK LETTERS, NO CURSIVE. Click HERE to access each postures authorized dialogue for our training. Once you are done creating them, study them in short 5-10 minute bursts. Then, take 10 minutes breaks, and then do another 5-10 minutes memorizing, and so on, so in one hour you will only be spending 20-30 minutes doing actual memorization but your brain will be working on it for the whole hour. This is a very effective memorization technique. This is the preferred method. *One way of making the task easier and less time consuming is to print out the dialogue and cut and paste it on to the 3x5 cards. Although this method is less effective at memorization than writing it all down, the study technique is the same. Keep a few postures with you at all times. You should utilize this method throughout the training and throughout your life. It’s never a bad time to sharpen your skills and these cards are your finely sharpened axe. If you have any questions/Problems please TEXT us directly at 480-234-7506 for quickest response.